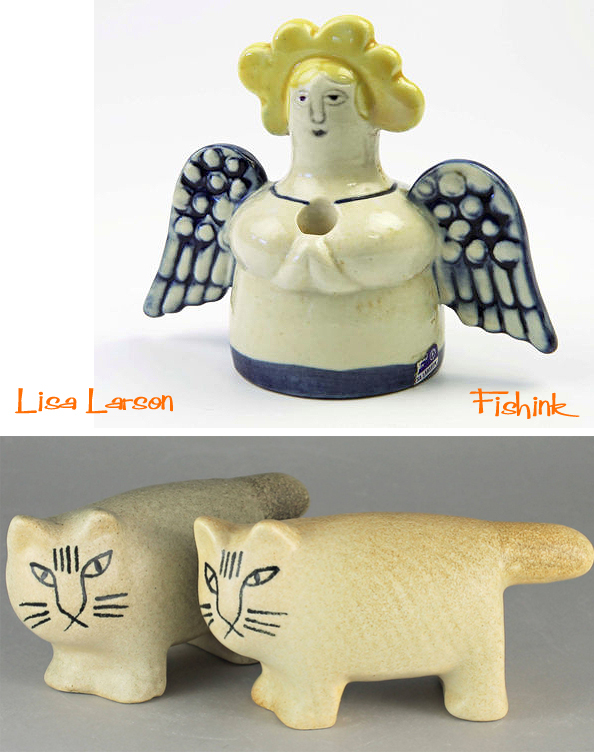 Lisa Larson has already appeared twice on Fishinkblog, here and here. 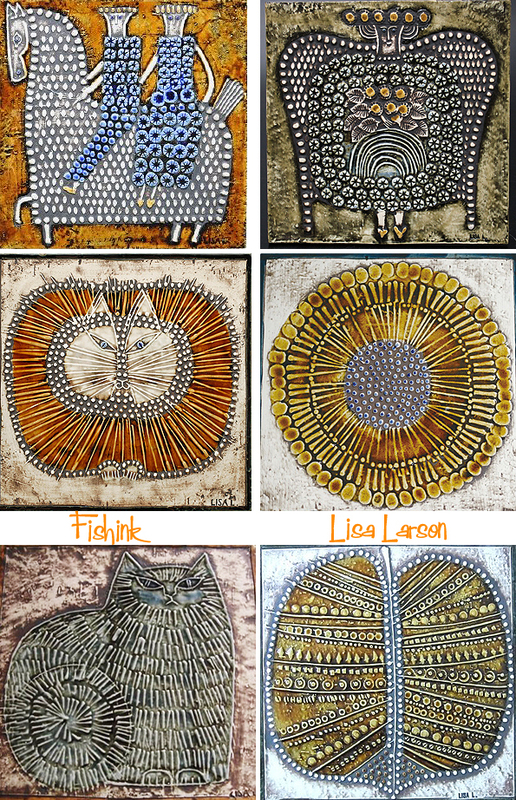 I love the quirky ideas she creates in her work and the shapes she makes too. 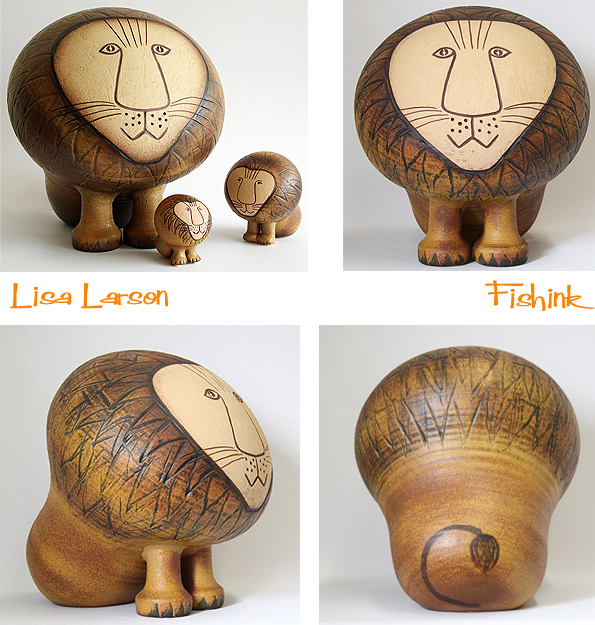 Lisa says “I’ve got such a curious nature! I’m constantly wondering how things will turn out. If I see a child on the bus who catches my attention, I want to rush immediately to my studio to see if I can capture the child’s character. 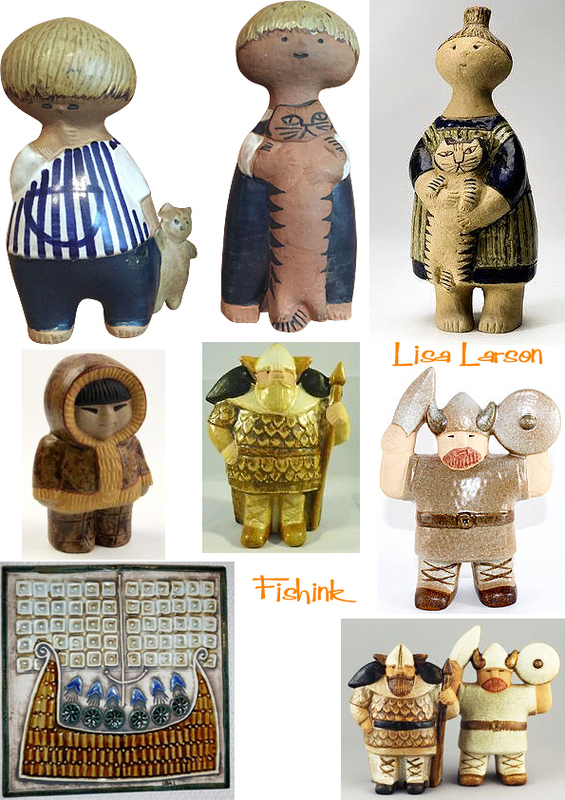 If I can get it tight and remember the feeling.” According to Wikipedia, Lisa Larson (b. 1931) attended the school of the Society of Crafts and Design in Gothenburg and subsequently worked in the Gustavsberg factory. Scant information about a Swedish artist whose works are found in Swedish homes on a massive and more or less unparalleled scale. Chubby children, luscious women, angels, cocky pugs, kind lions, tough politicians, aloof cats and Pippi Longstocking. 1954–1980 are golden years at Gustavsberg. 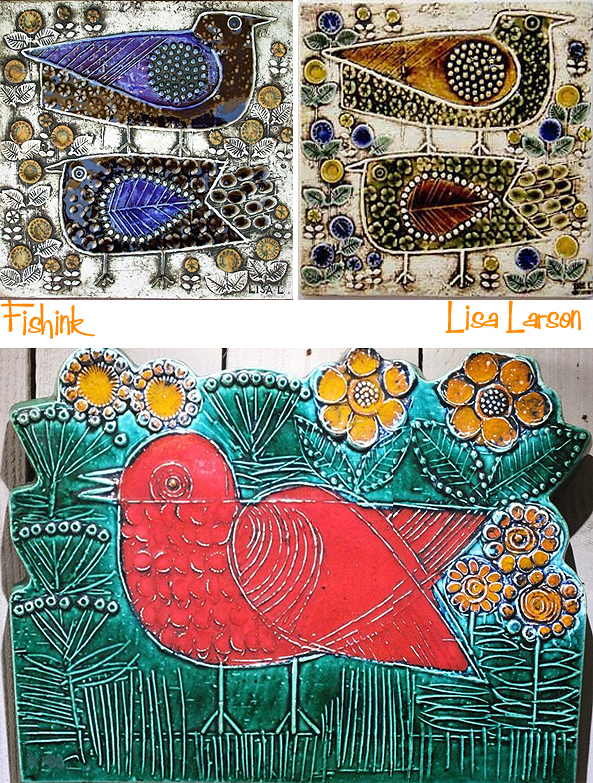 Lisa Larson’s creativity never seems to wane, and sales successes follow one another. Although the management is happy enough, it does not show in her pay packet. The pay is low, lower than that of her male colleagues, and she does not get any royalties. “I couldn’t afford to buy my own work. We had just enough to get factory seconds. Today, I own barely ten percent of all the items that went into production.” But the atmosphere was receptive and working spirit was high. Larson had assistants and unlimited technical resources. For her, the demand that products need to be durable and suitable for mass production was merely exciting and a challenge. One day she saw a jar thrown on a wheel by an assistant. She went to it and began twisting and turning the chubby piece of wet clay. 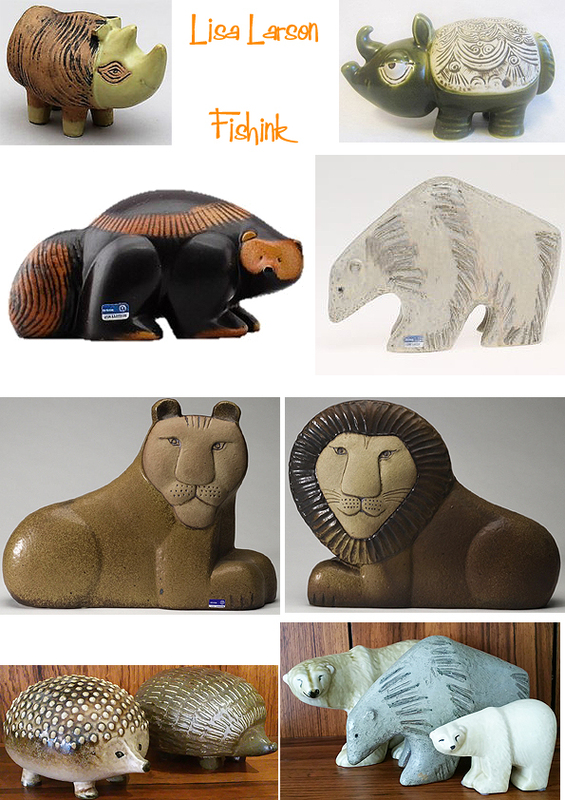 Suddenly the image of a lion flashed in her mind, and she carved a lion’s face with a kind and tranquil expression on the jar. Another big seller was born. 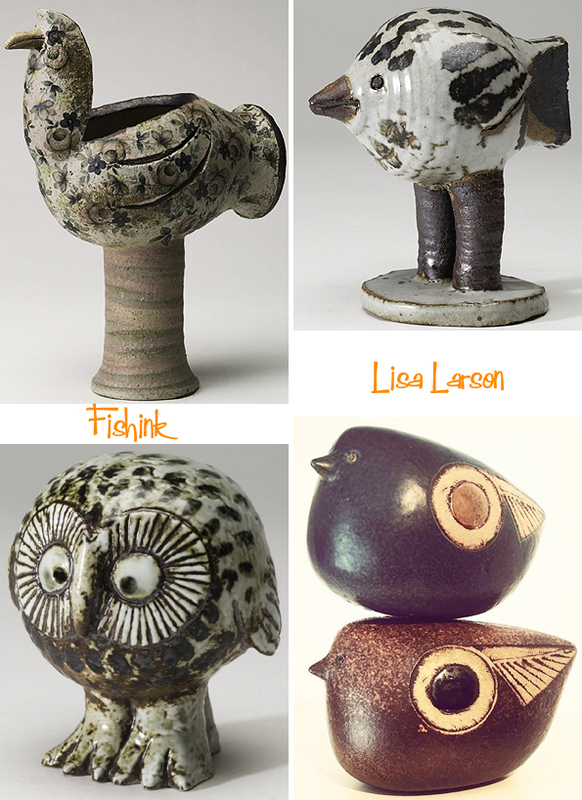 I’ve been a fan of Lisa’s work for so long that I’ve just invested in a family of these contented chaps ! Another memorable story begins with a big meeting, a brainstorming session that in the democratic spirit of the 1970s involved all personnel in the company. The reason for the session was that Gustavsberg had just received a patent for a new durable material: melamine. The mood was listless, none of the shy staff had the temerity to take advantage of the opportunity to speak freely. 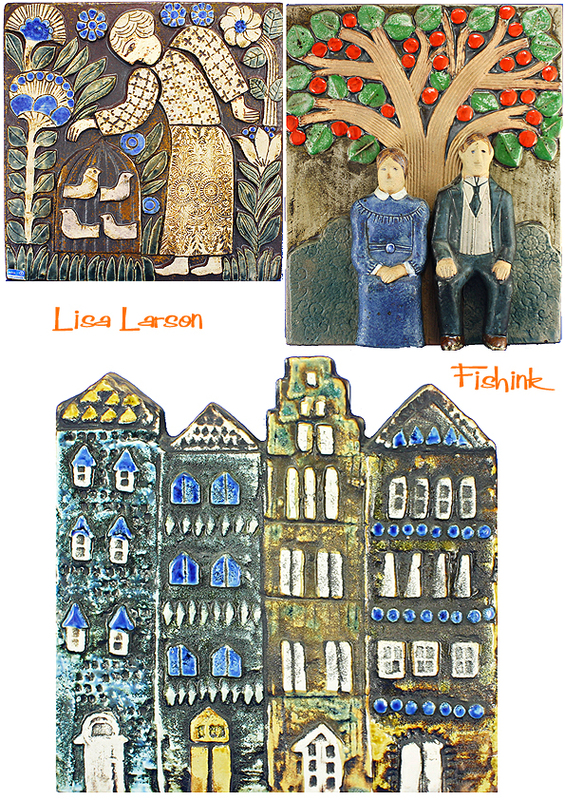 Lisa Larson felt she had to break the silence. This was 1972, the oil crisis was looming, and Finance Minister Gunnar Sträng appeared often on television with his finger raised, warning against the pursuit of luxury and over-consumption. ”Why don’t we make a piggy bank in the shape of the Finance Minister?” Everybody fell silent, but Larson remembers the marketing people pepping up. And so it would be. Larson asked her children to give a shout whenever they saw the minister on TV, but every time she came running the minister had already turned his back. So she did it from memory. Larson would have preferred a piggy bank that does not open, but would have to be smashed first. The final product, however, which remains popular to this day, does have a hole in it. And a good thing too. 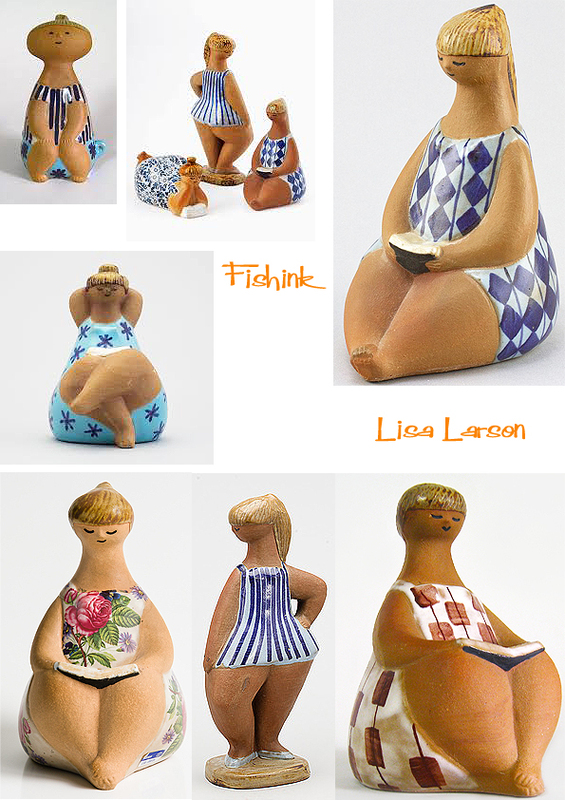 Here are some more of her tranquil figures. 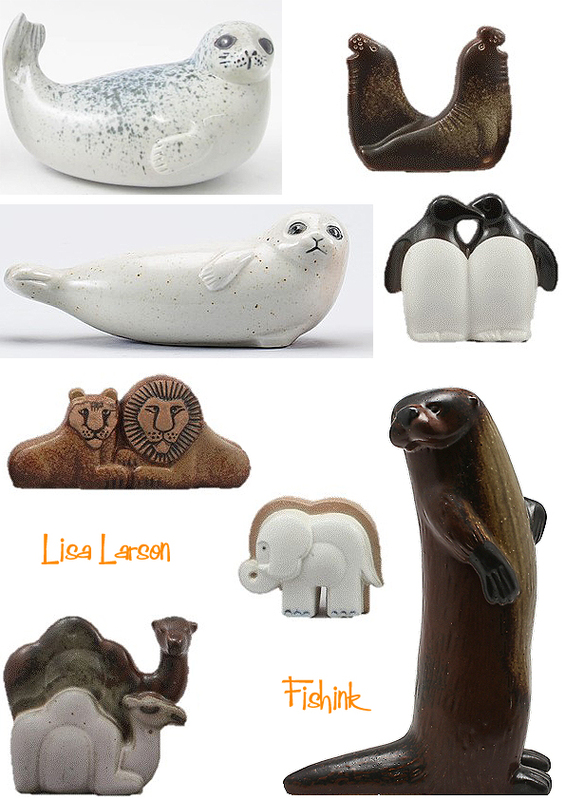 Although Lisa Larson’s output is endlessly variable, her ceramic Noah’s ark nevertheless has an consistent feel, an emotional mood typical to her work. Everything radiates a kind of inner peace, a gentle satisfaction. 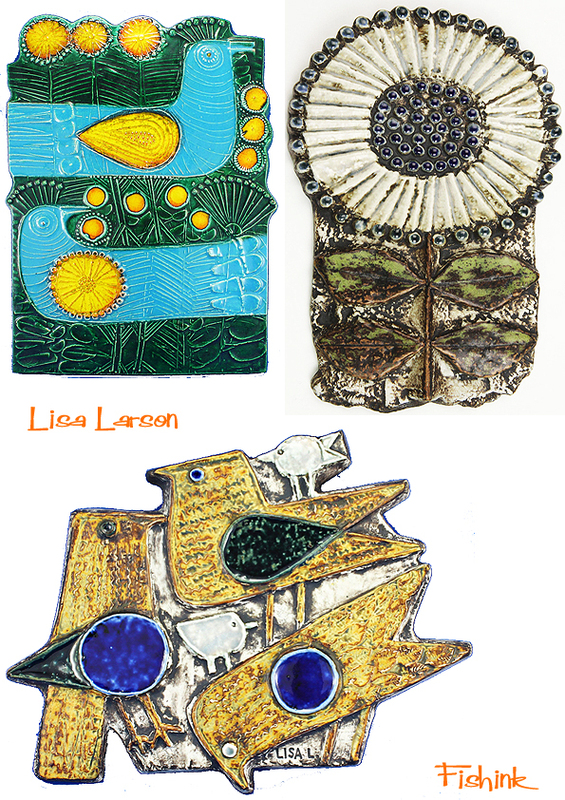 The reason why people love Lisa Larson’s art is that it contains a generosity towards the world. 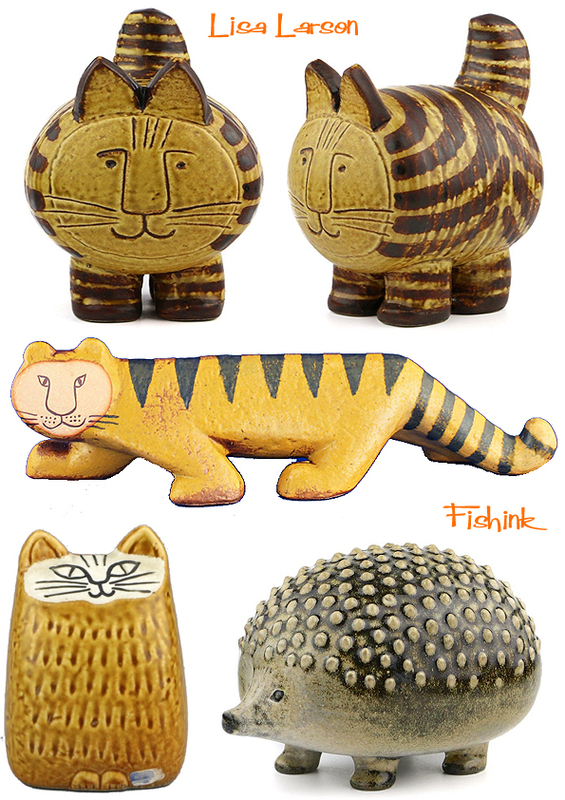 It embraces everything that is alive and unpretentious, children and animals. The forms are organic and the textures inviting to touch. 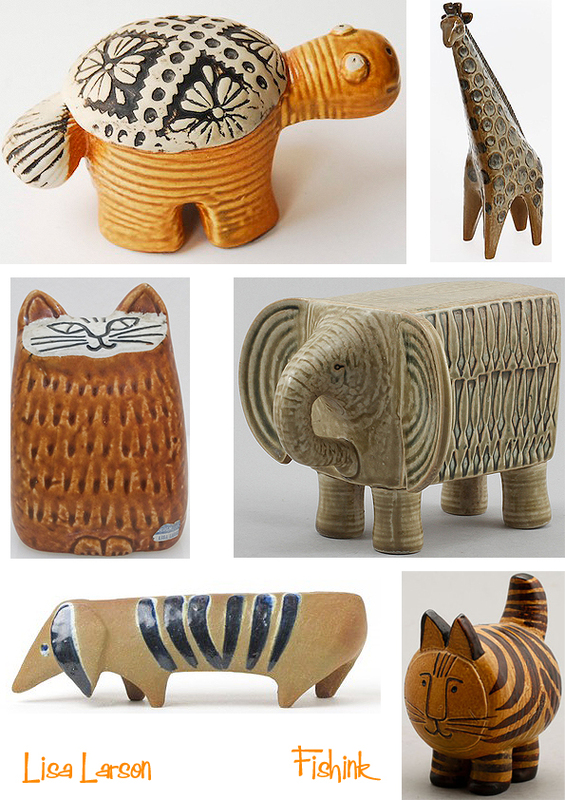 Her grumpy cats, lions and tigers still remain a firm favourite with me. Thanks to the auction site Bukowskis for the info used in this post. 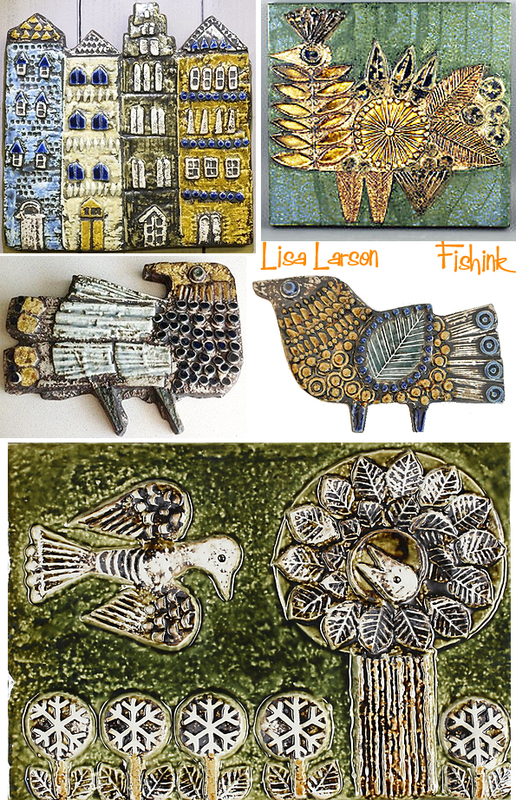 Long may Lisa’s work continue to delight and inspire not only myself, but millions of others. 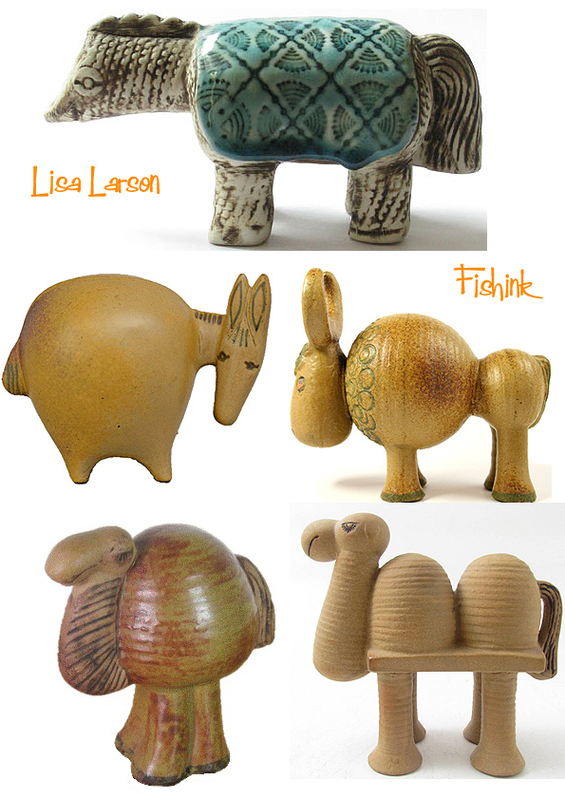 You can read a little more about the studio Lisa works at here. I loved the Portugal ones from last year too. Thank you Denise, much appreciate your comments. 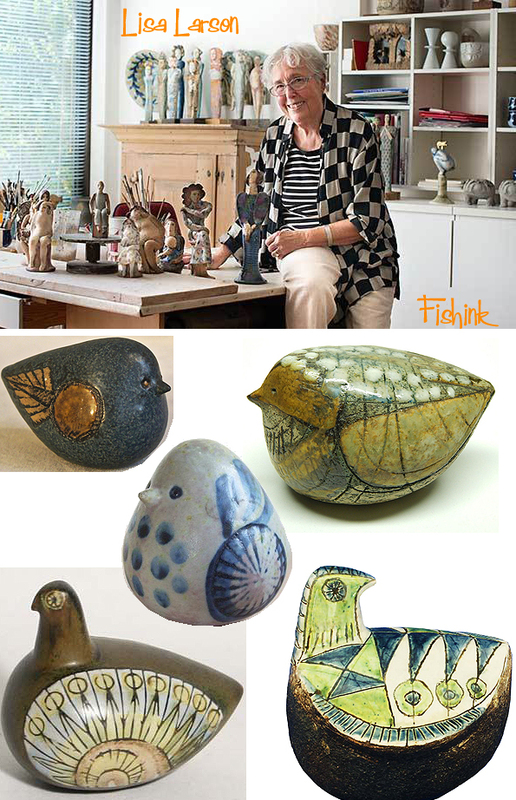 Lisa Larson, at 86, is living proof that contented creativity prolongs life – and enhances it for all of us! 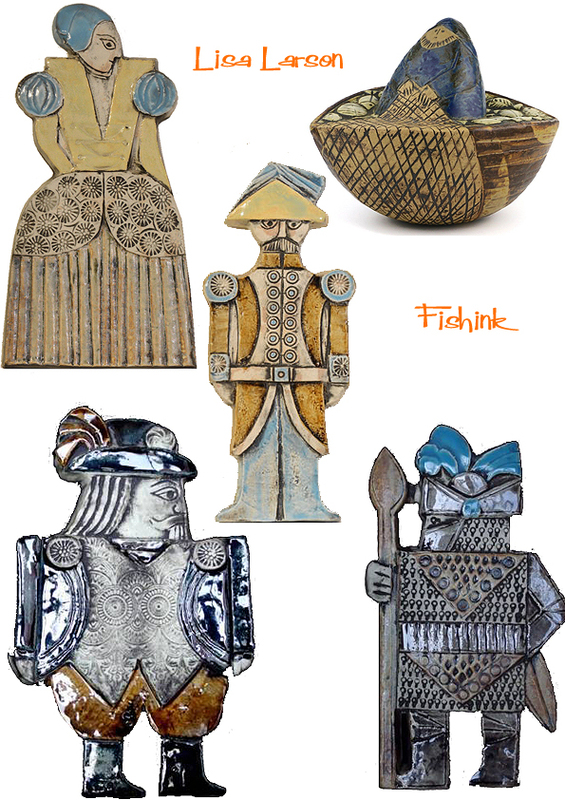 I love enthusiasts – and your blog is so joyful. Thanks also for the Daphne Padden post – I also do paper collage as part of the illustration course I am studying at Monash uni in Melbourne. Actually, every other student in the class insists on using photoshop and Illustrator – I’m the only one keen on collage – call me old fashioned! I showed my tutor, Daphne’s divine advertising collages from the 50s and 60s, all sourced from your blog. She had never heard of Daphne before, and was thrilled and amazed to see her work – all of it done with good old scissors and glue,before digital enhancement killed the sparkling life in illustration! Thank you Deidre for your own spark and enthusiasm. Very welcome to my blog too. If I were you I’d stick at the hand made collage work as I’m convinced that it does make people’s work stand out from the computerised crowd. Good luck with your collage work too. Oh wow! I adore her stuff. It’s wonderful. So cheering. 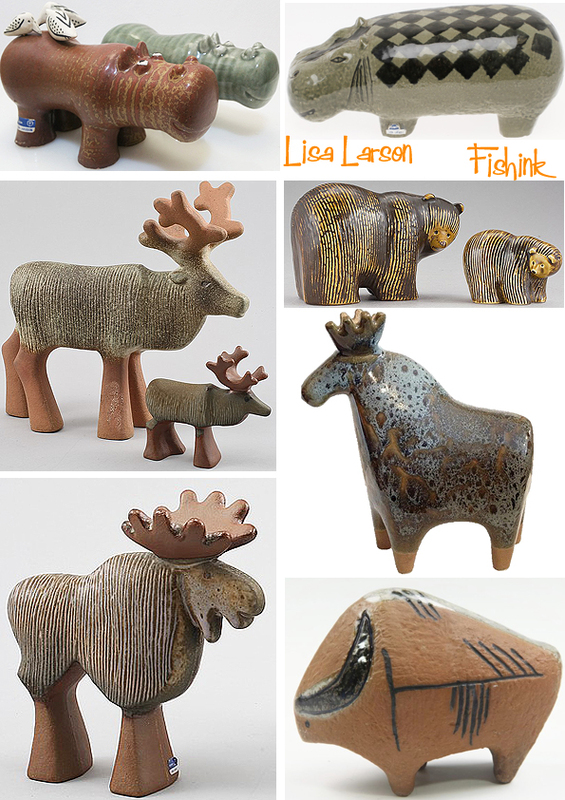 I found myself creating a wish list of the pieces I most want: Lions, birds, seals, moose….